Tasteful North Country home on 10+ acres. This elegant log and stone sided home features an attention grabbing 18' x 21' master bedroom as well as a 32' x 48' insulated and heated pole-buiilding! The pole building works for storing, working on or playing with toys, gizmos and gadgets. 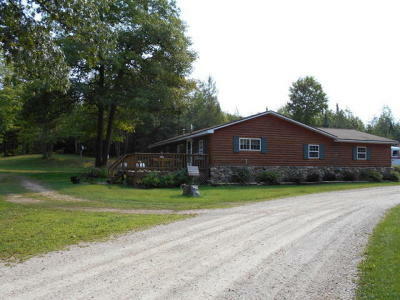 The home is located squarely in ATV/Snowmobile country! A second home is included on the property in the form of a 3 bed 2 bath mobile home! 2 homes for the price of 1!